HTML5 Video Player | Mac App Storeのアプリ検索・ランキング BuzzMac! * Encode video files to HTML5 video compatible format(include MP4, WebM, Ogv) in a batch mode. * Support all modern and old web browser with HTML5 video and Flash fallback. * iPad/iPhone and mobile device compatible. If you are looking for the best way to put video media on your own website, you got the right place. Our HTML5 Video Player software provides a one-stop solution for you to encode your video files and embed into your own website in minutes. HTML5 Video Player works as easy as 1-2-3. 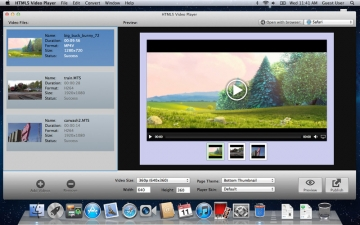 You just need to add your video source file, pickup a theme then the web page is ready for you to upload and publish. 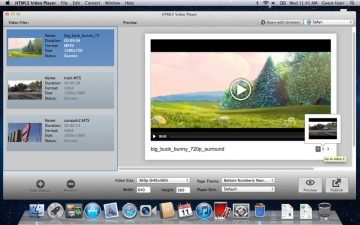 HTML5 Video Player integrates video converter function in the software. It can convert from almost all the video formats and encode it to HTML5 video compatible format needed for all popular browsers: include MP4, WebM, OGG video(.ogv). HTML5 Video Player software also supplies a basic video editor function, you can preview, trim,rotate and flip your video source files. HTML5 Video Player software plays your online video on all popular web browser. The video player uses HTML5 video tag which is compatible with all latest version of browsers, including IE9, Firefox, Chrome, Opera, iPhone/iPad/Android mobile browsers. While HTML5 video is not supported on old version browsers, HTML5 Video Player software will fallback to Flash object to play your video which ensure your videos play smoothly on all browsers.